Starting with the 2010 my, toyota began a gradual transition to the use of synthetic 0w-20 viscosity engine oil. Techtip: condition: engine no start and/or poor engine power dtcs set immediately after performing service on the inverter such as ssc d0m for ipm replacement or inverter assembly installation. Starting with 2010 model year, toyota began a gradual transition to the use of synthetic 0w-20 viscosity engine oil. there a re man benefits of this oil. Engine no start and/or poor engine power dtcs set immediately after performing service on the inverter such as ssc d0m for ipm replacement or inverter assembly installation. Tsb: some 2011 - 2015 model year highlander hv vehicles may exhibit a condition of mil "on" with dtc(s) p2111 and/or p0a0f after a cold soak. follow the repair procedure in this bulletin to address this condition. Tsb: some vehicles equipped with 2gr-fe/fxe engines and a towing package may exhibit a leak or oil seep from the engine's oil cooler pipes. C0f expired on may 31, 2015. Toyota: on certain vehicles, a knock or rattle noise, coming from engine compartment, is heard during a cold soak startup, and the condition lasts approximately one second. model years 2009-2012 camry, highlander, sienna, venza, rav4. Toyota: there is a knocking or rattling noise coming from engine compartment, for a short period of time, after a cold soak startup. model 2010-2012 camry, 2009-2013 highlander, venza, 2009-2012 rav4, 2011-2013 sienna. Toyota: certain vehicles, after a cold start, would run rough on initial start up. Toyota: on some vehicles, the engine oil cooler pipes may exhibit an oil seepage. information has been provided regarding this issue. This bulletin contains general vehicle pulling diagnosis and repair procedures along with specific information to help correct pulling complaints. This bulletin includes basic procedures for inspecting and adjusting world standard (ws) automatic transmission fluid (atf) level at normal vehicle operating temperature. Tsb: the purpose of this bulletin is to assist in the identification and location of serial numbers on 2006 - 2014 model year automatic transmissions. Tsb: the purpose of this bulletin is to assist in the identification and location of serial numbers on 2006 -2014 model year remanufactured automatic transmissions. Toyota: there is a whining noise when vehicle is driven above 35 mph, from final drive gear assembly and a repair procedure has available to address this issue. model 2008-2013 highlander. 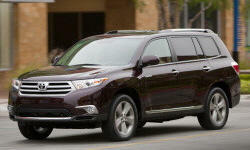 Toyota: 2008-2011 highlander. there may be an oil leak in the front gears due to a manufacturing process. The customer is having difficulty changing the multi-display screen from day mode. if the multi-display screen is set to day mode when the headlights are on, the setting we be memorized when the engine is turned off. Some customers may complain that the rear seat entertainment (rse) system is inoperative if the have misplaced the parental passcode for the system. On some highlander, sienna, and sequoia vehicles, a plastic clamp connecting the rear a/c lines may become loose. this may allow separation of the a/c lines and a loss of refrigerant. Dealer letter: toyota will be sending safety recall follow-up notices to remind owners whose vehicles have not yet had campaign repairs completed. Region letter: toyota will be sending safety recall follow-up notices to remind owners whose vehicles have not yet had campaign repairs completed. If a customer states there is an unpleasant odor in the vehicle from the hvac system, there are various factors that may be involved. Tt: when replacing components on vehicles equipped with the power back door option, please reference the following guide to ensure the correct parts are used in combination with each other. Southeast toyota accessory advent navigation system displays splash screen only or randomly shuts off, discusses audio system hard reset procedure and updated software card. Tsb: obsolete notice-june 12, 2015: this bulletin is now obsolete. please see t-sb-0038-15. Tech tip: since my 2011, several different update or upgrade usb ssts have been issued for toyota audio and navigation systems. Toyota: accelerator pedal sensor assembly information regarding the inspection, removal, and installation, if lubrication or oil, is applied. This bulletin is now obsolete. please see t-sb-0012-13. Ssts are key elements to provide your customers with swift and accurate repairs resulting in superior customer satisfaction. This bulletin is now obsolete. please see t-sb-0041-13 . Region email: toyota is announcing a warranty enhancement program to extend the warranty coverage for the power back door on certain 2008 - 2013 model year highlander and highlander hybrid vehicles. Dealer email: toyota is announcing a warranty enhancement program to extend the warranty coverage for the power back door on certain 2008 - 2013 model year highlander and highlander hybrid vehicles. Please refer to the following recommendations for the best practices for vehicle tire rotations. Dealer package: this limited service campaign has expired as of october 31, 2016. Warranty policy bulletin: toyota has received reports of customer concerns in which the power back door does not close properly. in some cases, the power back door may reach the fully closed position and then reverse to the open position. In our continuing efforts to ensure the best in customer satisfaction, toyota is launching a limited service campaign (lsc) on certain 2011 ? 2012 model year highlander hybrid vehicles. this lsc will cover approximately 4,000 vehicles. Tsb: obsolete notice march 17, 2017: this bulletin is now obsolete. please see t-sb-0191-17. Since my 2011, several different update or upgrade usb ssts have been issued for toyota audio and navigation systems. refer to the chart below for a comprehensive list of all current and previously issued usb ssts and their applicability. The procedure in this bulletin is a general guideline on how to properly diagnose the air conditioning system after a component failure. refer to the applicable repair manual for vehicle specific repair procedures and parts. Some customers may complain that the rear seat entertainment (rse) system is inoperative if they have misplaced the parental passcode for the system. Tips for writing a dpr (dealer product report) on manufacturing issues for windows and windshields. In mid-april 2013 toyota will be mailing an update to the owner's manual for 2008 through 2012 model year highlander and highlander hv. sample owner labels are provided below for your reference. Toyota: see document search button for owner letter. information provided regarding the updated owner's manual for certain vehicles. models 2008-2012 highlander. Toyota: information provided for replacing the seat covers for vehicles equipped with side airbags. Toyota: the rear lift glass hatch exhibits a possible condition whereby it fails close properly. Toyota: floor mat installation during pds. vehicles equipped with driver's side floor mat retaining clips to secure the floor mat in correct position.